According to scientists, about 95% of the world’s ocean remains unexplored. One could say the same about eBay. Some elements of a film become so iconic that they transcend the film itself. You don’t even have to see the film in order to know what it is. And then, there are other items from those same films that are rightfully forgotten because they are ordinary and fairly forgettable. My friends, these are the kind of items you can find on eBay. This week’s selection includes many of those, plus an amazing item from a James Cameron film not called Titanic and something sort of involving Jennifer Lawrence. I have watched A Christmas Story so many times, yet I don’t remember this being in the film at all. If you buy this and use it, nobody will be able to immediately identify it with A Christmas Story. The leg lamp, if it still exists, would be the one you want. I have no idea what a Bregna Carrier System is, but I am angry that this item reminded me that this movie exists. I never saw Aeon Flux, but I remember watching the horrible trailers for it when it first came out in 2005. Look it up. 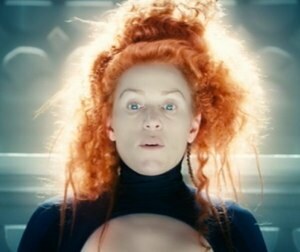 It makes Frances McDormand look like a cross between Galadriel and Peppermint Patty. And for some reason she is glowing. It’s hilarious. Do I want hand drawn sketches from one of the greatest action movies of all time? Do I want hand drawn sketches from one of those most insanely insane directors of all time? If it has Aliens and Ripleys, and no blue people, then I’ll take a peak. I don’t know what this is. Also, I have never seen The Beaver. I just know it’s about Mel Gibson talking to a beaver hand puppet who is probably anti-Semitic, too. There is only one hand puppet I like, and his name is Franklin Delano Bluth. I can never get enough of “FAH Q,” or the fact that it was used by a future Oscar winner. 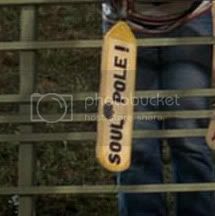 I just wish they also sold “Soul Pole” as part of this package. A lot of Jurassic Park props get sold on eBay on a daily basis. Jurassic Park is basically the dinosaur version of Titanic. Buy this item as a piece of nostalgia. Relive the good ol’ days when smoking was so ubiquitous that every inanimate object in the world could be turned into a lighter. Cannibal island skull? Here I thought Pirates of the Caribbean was a family movie. Only $30 for a shot glass that John Wayne drank fake alcohol out of on the set of an old western? That is an outrage. An item this precious should be priceless. It would be a dream to drink (or fake drink) with The Duke. This is great. The scene where Bradley Cooper and Jennifer Lawrence go on a date at the diner is one of my favorite scenes in a film that is made up of great scenes, and it gets me every time when Jennifer Lawrence says, “it can still be a date if you order Raisin Bran.” But why did the user write “Jennifer Lawrence” in the title for this item? Come on! 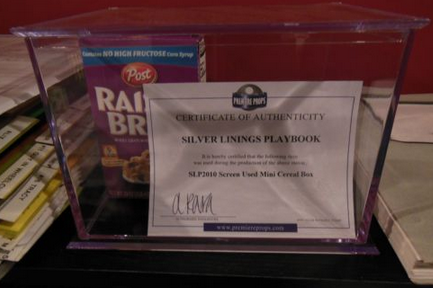 This was Bradley Cooper’s Raisin Bran! Also, this is the first and last time you will ever see a cereal box in a glass container like it is a diorama in the Museum of Natural History. This entry was posted in Uncategorized and tagged A Christmas Story, eBay, James Cameron, Jennifer Lawrence, Movie Memorabilia on March 5, 2014 by ian0592.